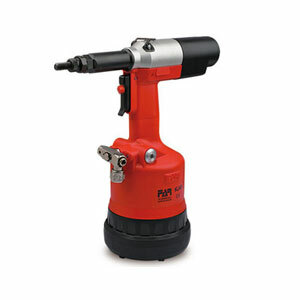 Far Tools UK – As a leading authorised distributor of Far riveters we offer a comprehensive range of FAR pneumatic tools and hand tools – FAR Rivet Guns & FAR Rivet Nut Tools. 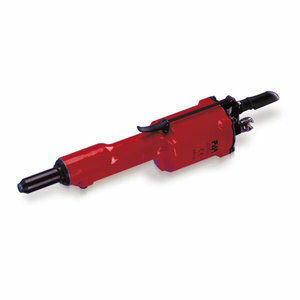 If you have been looking for high quality, reliable production riveting tools at a great price look no further. Far tools are ideal for setting blind rivets (pop rivets), rivnuts, structural rivets and lock-bolts including Huck & Pop Avdel fasteners – Magna-Lok®, Monobolt®, Ultra-Grip®, Avdelok®, Magna-Grip® and Hucktainer®. We distribute FAR Riveters across Europe and export to other world markets including the USA, New Zealand and Vietnam. We offer low shipping costs and a fast and reliable delivery service. Call us for expert advice and enjoy on-line access to the UK’s most comprehensive stock of Far Tools & Far air tool spares and our rapid in-house air tool service and repairs. 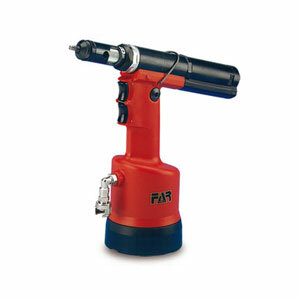 FAR pneumatic tools & hand riveters have been manufactured in Bologna, Italy, since 1957 and continue to set the benchmark for production riveting tools. Buy with confidence – we supply at the lowest UK prices & every sale is backed by the very highest levels of customer service and support. 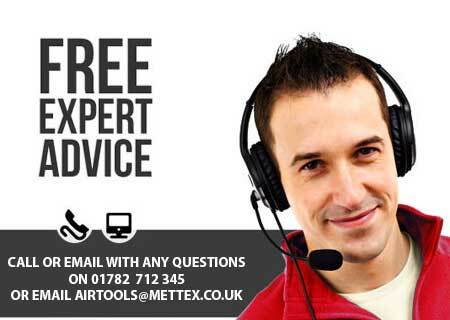 If you need help choosing a FAR pneumatic tool we can arrange a no obligation on site demonstration – just contact airtools@mettex.co.uk or call 01782 712345 and ask for Bernie. 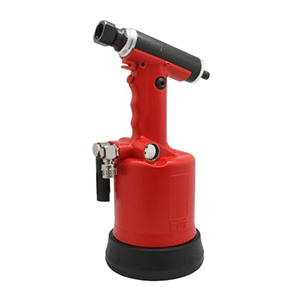 FAR riveters are robust & reliable tools suitable for production workshops & line-side, tool-station volume riveting applications. 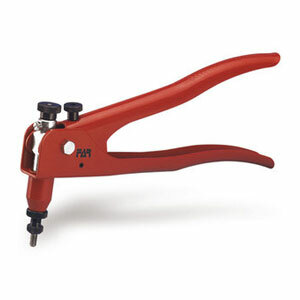 These industrial rivet guns are ideal for setting aluminium, steel & stainless steel Pop rivets & Huck & Avdel structural rivets and pin & collar lock-bolts. RAC171 – The FAR RAC171 heavy duty structural rivet tool is ‘best in class’ for setting large diameter rivets. Use it to install standard and structural rivets in all materials up to Ø6.4mm including Huck MagnaLok® and Avdel Monobolt®. 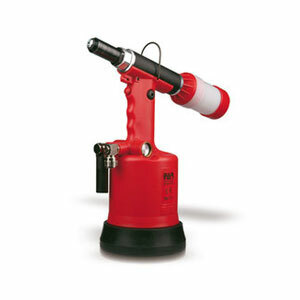 This riveter offers great reliability and a distinct price advantage over its rivals. 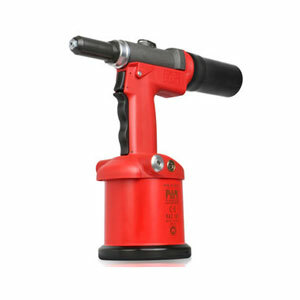 A useful feature of the RAC171 is that when connected to the air line, the gun hold the rivet in the nose piece enabling one hand operation. After setting the rivet the tool feeds the spent mandrels into a detachable container. The riveter is backed with a 12 months warranty. We stock all the rivet gun spare parts for your RAC171 & offer highly competitive rates for air tool service & repair. RAC180 – The FAR RAC180 heavy duty air rivet tool is designed for setting rivets in industrial manufacturing applications. It remains one of our best selling tools. 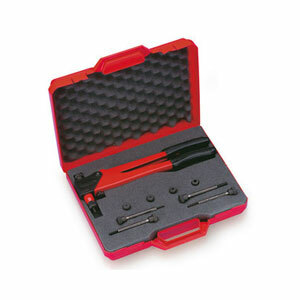 This FAR riveter sets blind rivets from Ø2.4mm to Ø4.8mm in all materials and up to Ø6.4mm aluminium. Connect the riveter to the compressor & the rivet is held in the jaws enabling one hand operation. After setting the rivet a vacuum extracts the spent mandrels into a detachable container. 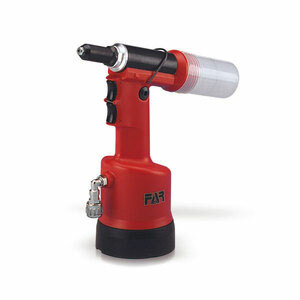 Made in Italy, this great FAR pneumatic tools has a 12 months warranty. We carry all the rivet gun spares for your RAC180 in stock & offer highly competitive rates for riveting tool service & repair. 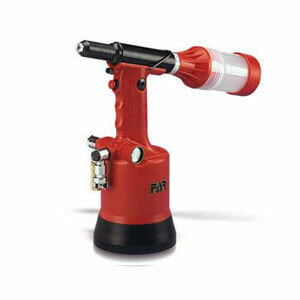 FHU05 The FAR FHU05 structural pneumatic rivet tool & lockbolter has more traction power than other tools of similar size. It is built for heavy production use & offers reliable operation over extended periods. The tool-head accepts a wide range of nose assemblies (sold separately). These can be changed quickly & easily to set structural rivets and lock-bolt pin & collar fasteners including Magna-Lok®, Monobolt® , Ultra-Grip® , Avdelok® , Magna-Grip®, Hucktainer®. Made in Italy, this class leading tool has a 12 month warranty. We carry all the spare parts for your FHU05 & offer highly competitive rates for rivet tool service & repair. KJ17 – The FAR KJ17 is a simple pliers type hand rivnut tool offering a cost effective solution for setting small diameter aluminium and steel rivet nuts (rivnuts, nutserts) from M3 to M6 and stainless steel rivet nuts up to M5. KJ21 – The FAR KJ21 hand rivet nut tool has an excellent ratio amplifier making light work of setting rivet nuts (rivnuts, nutserts, threaded inserts). We supply it in a kit that contains the mandrels required to install aluminium & steel rivnuts from M3 to M8 and stainless steel rivet nuts up to M6. A ‘must-have’ for your toolbox! KJ29 – Developed from the popular FAR KJ28, the new FAR KJ29 Long Arm Rivet Nut Tool is compact and light weight with less effort required when installing the rivet nut. It sets steel & aluminium rivnuts from M3 to M10 and stainless steel rivnuts up to M8. A great feature is its quick action spin on/off system. This allows for fast mandrel withdrawal from the installed rivet nuts. The FAR KJ29 is supplied with a complete set of M3 to M10 mandrels and nosepieces. Far offer two robust & reliable pneumatic rivet nut tools suitable for production setting of aluminium, steel and stainless steel rivnuts in industrial workshops & line-side applications. KJ45s– The FAR KJ45s is a heavy duty pneumatic rivet nut tool ideally suited to high volume setting of threaded inserts in a production environment. This ultra-reliable tool will set aluminium, steel & stainless steel rivet nuts from M3 up to M12. It is supplied with a complete set of mandrels and nose-pieces. Made in Italy, it has a 12 month warranty. We stock all the spare parts for your KJ45 rivet nut tool & offer highly competitive rates for air tool service & repair. KJ60– The FAR KJ60 is a class leading tool tool ideally suited to high volume setting of rivet nuts. 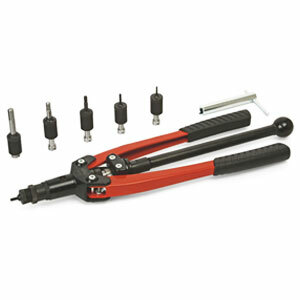 One of our best selling rivnut tools, it is ultra reliable and very simple to operate. It is supplied with a complete set of mandrels and nose pieces to set aluminium, steel & stainless steel rivet nuts from M3 to M8. We stock all the spare parts for your KJ60 rivet nut tool & offer highly competitive rates for air tool service & repair. We also have selected a range of class leading POP Advel Rivet Tools offering you the very latest in rivet setting technology. Buy POP Rivet Guns, POP Rivet Nut Tools & Avdel Tools with confidence knowing that every sale is backed by the very highest levels of customer service and support – we are here to help.